It’s been a while since I have been on my breakfast soapbox here, so allow me to once again wax evangelical about my favorite meal. You all know how breakfast is supposed to be the most important meal of the day, I am sure. It’s been a constant refrain of a million cereal commercials and mothers all around the world. So, I won’t bother repeating it…although it seems I just did. I’m here to tell you that breakfast can be your best friend. It is exactly what you need at the beginning of your day, when the carnival of “the whole world” and all its demands/wonders/foibles has not yet made its way to you. It can be that rah-rah-rah that gets you going. It can be that comforting hug that tells you that this too shall pass. It can be the buttressing you need to get through an especially trying workday. It can be the elixir that lets you move mountains/change the world/answer 100 emails/do the laundry. When I say breakfast, I don’t just mean what you eat, but also the time you take to eat it. Giving yourself a dedicated moment (no matter how long or short – I prefer long and luxurious, but I am aware that we do live in the real world majority of the time) to start your engine can be just as important as what you use to start it. What’s that you say? You’re not a morning person? Well, let me tell you, with much resolution, neither am I. I hold a PhD in sleep and have, in the past, spent a good part of my life waking up at noon. But I can promise you, in all sincerity, that it is worth it. It really sets the tone for my day, gets me started confident and raring to go, instead of rushing forth blindly, blouse untucked, without plan or compass. It also keeps me from getting to lunch time starving, devouring the closest thing at hand, whether that be a week-old serving of Spam or 3 stale Krispy Kreme donuts. Believe you me, breakfast is in all our best interests. Take the time to enjoy it. Here’s another way how. 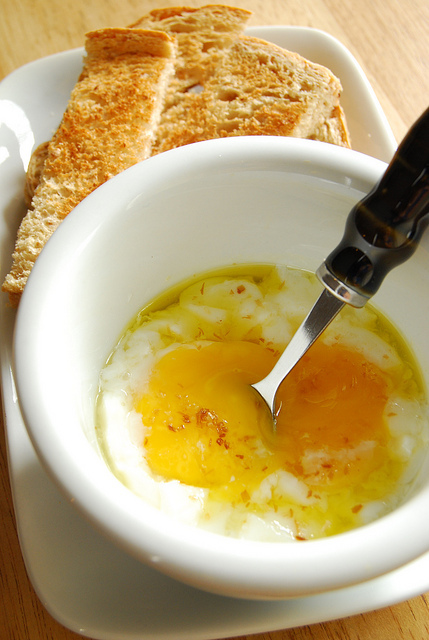 – Cook your eggs soft boiled using your preferred soft-boiling method. I won’t claim to have the best or sure-fire way of doing this. It’s a much-debated topic that I won’t get into here. If you’d like to know though, this is how we do it: I place the 2 eggs in room temperature water in a small pan, then place on high heat for about 5-7 minutes. I like my soft boiled very soft…just-set whites and gloriously runny yolks-gone-wild! – While your eggs are cooking, make your toast soldiers. Toast a slice of bread, and then cut lengthways into 4 strips. You can butter these if you wish, but I forwent the butter since I used truffle oil in the eggs. A moment of uncharacteristic restraint….who knew? – When your eggs are done, peel the tops off gently and scoop the eggs into a small bowl or cup. – Drizzle truffle oil over the eggs and sprinkle with mushroom salt. Mix and taste…adjust seasoning. Consume immediately! You can dunk the soldiers in the eggs or, as I love to do, just toss the soldiers into the eggs and press them down until all the egg is absorbed and the bread is a soggy mess of truffle-mushroom egginess! Although we would all benefit, both health-wise and in taste, from buying free range eggs, their rich flavorful yolks are most especially enjoyed in preparations like these. So do spring for them if you can! The mushroom salt I chanced upon at one of my favorite stores, owned and operated by friends who are passionate about all things local and sustainable. You can check it out here. If you are in Manila I highly recommend a visit…it’s a charming general store type gem offering all sorts of locally sourced goodies. Bring your own containers if you want to stock up on salt and rice. I love the subasta cacao, any of the sea salts, and the lemongrass hand wash. I hope this has inspired you somewhat, even just a little bit, to go and set your alarm clock a smidgen earlier, and celebrate breakfast! Rise and shine everyone!